We’d love your help. 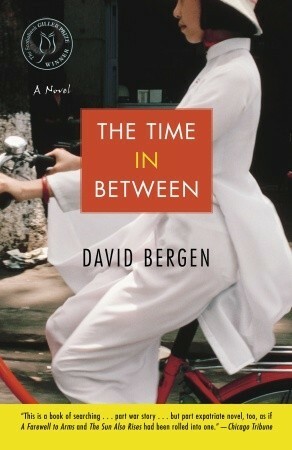 Let us know what’s wrong with this preview of The Time In Between by David Bergen. In search of love, absolution, or forgiveness, Charles Boatman leaves the Fraser Valley of British Columbia and returns mysteriously to Vietnam, the country where he fought twenty-nine years earlier as a young, reluctant soldier. But his new encounters seem irreconcilable with his memories. When he disappears, his daughter Ada, and her brother, Jon, travel to Vietnam, to th In search of love, absolution, or forgiveness, Charles Boatman leaves the Fraser Valley of British Columbia and returns mysteriously to Vietnam, the country where he fought twenty-nine years earlier as a young, reluctant soldier. But his new encounters seem irreconcilable with his memories. When he disappears, his daughter Ada, and her brother, Jon, travel to Vietnam, to the streets of Danang and beyond, to search for him. Their quest takes them into the heart of a country that is at once incomprehensible, impassive, and beautiful. Chasing her father’s shadow for weeks, following slim leads, Ada feels increasingly hopeless. Yet while Jon slips into the urban nightlife to avoid what he most fears, Ada finds herself growing closer to her missing father — and strong enough to forgive him and bear the heartbreaking truth of his long-kept secret. Bergen’s marvellously drawn characters include Lieutenant Dat, the police officer who tries to seduce Ada by withholding information; the boy Yen, an orphan, who follows Ada and claims to be her guide; Jack Gouds, an American expatriate and self-styled missionary; his strong-willed and unhappy wife, Elaine, whose desperate encounters with Charles in the days before his disappearance will always haunt her; and Hoang Vu, the artist and philosopher who will teach Ada about the complexity of love and betrayal. We also come to learn about the reclusive author Dang Tho, whose famous wartime novel pulls at Charles in ways he can’t explain. Moving between father and daughter, the present and the past, The Time in Between is a luminous, unforgettable novel about one family, two cultures, and a profound emotional journey in search of elusive answers. To ask other readers questions about The Time In Between, please sign up. Just a few notes here before this book evaporates into the ether on me; which is not an indictment of its quality (more, my own poor literary memory. Hence the need for these notes.) Also, there are not enough reviews, nor readers, for this novel. It really deserves a wider audience. David Bergen, a Canadian writer, won the Giller for this in 2005 and another of his - The Age of Hope - was a finalist in Canada Reads 2013. I had never read him before. The Time In Between focuses on a U.S. veteran w Just a few notes here before this book evaporates into the ether on me; which is not an indictment of its quality (more, my own poor literary memory. Hence the need for these notes.) Also, there are not enough reviews, nor readers, for this novel. It really deserves a wider audience. The Time In Between focuses on a U.S. veteran who returns to Vietnam to exorcise the demons that have plagued him since his time there 30 years before, and who is followed there by two of his three now-adult children. The novel chronicles a family's experience of trauma and vicarious trauma, and their attempts to revisit the past, physically and in memory, as a means to recover from it. That, in itself, is enough to keep one reading, but Bergen does a couple of other things that are truly extraordinary and which *almost* push this into five-star territory for me. First, he writes with a concision that has been likened to Raymond Carver (whom I've not read) but that I would call Hemingway-esque. There is a deceptive simplicity to his sentences; on the surface, they are sparse and plain, but they reflect exquisite, minutely-observed, and perfectly-chosen details - as simple and stark, but as high-impact, as a fly in one's soup. The thinness of an ankle emerging from a too-short pant leg. A glimpse of a woman asleep in a storefront seen by a cyclist. A mangy dog, limping in an alleyway. There are actually three soldiers whose stories are woven together here: Charles, the father and U.S. veteran; a North Vietnamese soldier, who is a character in a book Charles is reading (that book based on a real one, The Sorrow of War); and an artist named Hoang Vu, whom Charles and later his daughter Ada meet and who was also a survivor of (and soldier in) the war. Each of these stories and characters have commonalities and are interlinked. There are also Charles' son, Jon, and his daughter, Ada, plus a host of other minor characters, all of whom are essential to the plot. Everything counts in this novel. There's not a line, not a character, not a detail that doesn't matter. There is something about the complexity of story (stories) and the starkness of the language in which they are told that sets up a vibrating thrum, low level but intense, that lasts and propels this thing forward to its several, inevitable conclusions. Some more things: stories are critical. Telling one's story can both save and destroy one, but regardless of how painful or what the story does, the telling is necessary. There is a motif around safety: characters repeatedly say they feel safe, or will keep something safe. The motif resonates both with its opposite, threat and destruction; and with the idea of secrecy - secret acts, betrayals, and shame. There are horrible scenes of brutality against animals. Anyone reading this who knows me knows that violence towards animals used gratuitously, for manipulation or for mere shock value, will cause me to abandon a book and judge it harshly indeed. As hard as these scenes were for me to read, they are important here. They create an atmosphere and illustrate a general level of violence against human beings that is almost worse for not being described. Finally, I read a lot of war lit, and am specifically interested in the war in Vietnam and that time in U.S. history. I would consider myself fairly well-read in the literature that has emerged from it. This book comes at that war from a slightly different angle: while it is concerned with the direct experiences of those who lived it, these are re-told as reminiscences or told indirectly by a generation many years removed from the events. Despite that, or perhaps because of it - and although none of the details shocked or surprised me - the story of the war and its effects retain an immediacy, a sledge-hammer present-tense. As traumatic memories do. It reminded me what a bloody awful war this was (as they all are, I suppose; although Vietnam feels worse somehow), and how far-ranging its impact continues to be. As such, The Time In Between is an important work to include in fiction about the Vietnam war. It reminds us what an incredibly brutal, soul-destroying impact that war had on those who lived it, and on those who have been living with it in the time between then and now. The Time In Between was even better than I'd hoped. Surrounded in both Vietnam and Canada culture, this book is amazingly-written and evocative. I'm trying very hard to find something positive to say about The Time in Between , but not much is leaping to mind. It wasn't the worst book ever, it was engrossing and easy to read, but having finished I don't feel that usual sense of gladness that I read it. The main story of the book, or so I thought, is resolved halfway through. After that it's as though the characters just didn't want to leave. They interact with other people, sometimes in significant ways, and yet don't seem to grow or dev I'm trying very hard to find something positive to say about The Time in Between , but not much is leaping to mind. It wasn't the worst book ever, it was engrossing and easy to read, but having finished I don't feel that usual sense of gladness that I read it. The main story of the book, or so I thought, is resolved halfway through. After that it's as though the characters just didn't want to leave. They interact with other people, sometimes in significant ways, and yet don't seem to grow or develop - it's just flat and rather meaningless. The language throughout is simple and unembellished, which makes the book a quick read and draws a thorough but rather unemotional picture of time and place. David Berger’sThe Time in Between won the Canadian Giller Prize in 2005, and it’s a captivating book. I wanted something interesting to read after the disappointment of The Big Fellow, so I began Brian Castro’s Drift, which I love, but that’s a complex book and not one for bedtime reading. The Time in Between, however, was ideal. It is a slow meditation on war and its aftermath, and how different cultures deal with it. The first part of the novel is framed around Charles Boatman, a Vietnam Veter David Berger’sThe Time in Between won the Canadian Giller Prize in 2005, and it’s a captivating book. I wanted something interesting to read after the disappointment of The Big Fellow, so I began Brian Castro’s Drift, which I love, but that’s a complex book and not one for bedtime reading. The Time in Between, however, was ideal. It is a slow meditation on war and its aftermath, and how different cultures deal with it. The first part of the novel is framed around Charles Boatman, a Vietnam Veteran who has never come to terms with his wartime experience. When his children are grown he comes across a novel about the war by a prize-winning Vietnamese called Dang Tho. This book introduces him to a Vietnamese perspective and is a catalyst for him to return to Da Nang, but he doesn’t really know what he hopes to find there and there is no resolution for him. It is heart-rending to read about this sad and lonely man floundering around trying to make sense of the incomprehensible. When he disappears, two of his children go to Vietnam to try to find out what’s happened to him, and they too try to find some sort of reconciliation. The story focusses mainly on Ada, who meets characters who are emblematic of the new Vietnam: entrepreneurial, energetic, and assertive. They are not what she expected; they are not focussed on the war. Not my favourite of David Bergen's but definitely his style. I find his writing so close to "home". Is it because he is Canadian that I find his writing so heartfelt? This book did not pan out like I thought it would. This is the story of a man from the U.S. who was in Vietnam and after returning from the war, moved to British Columbia and had a family. He returns to Vietnam to find redemption? forgiveness? himself? He loses touch with his adult children who go to Vietnam to find him. A very sad Not my favourite of David Bergen's but definitely his style. I find his writing so close to "home". Is it because he is Canadian that I find his writing so heartfelt? This book did not pan out like I thought it would. This is the story of a man from the U.S. who was in Vietnam and after returning from the war, moved to British Columbia and had a family. He returns to Vietnam to find redemption? forgiveness? himself? He loses touch with his adult children who go to Vietnam to find him. A very sad book. Lots of introspection by all the characters.
" I believe we are most alive when we are being thought about by others who love us." Sometimes I find myself disagreeing with the hype about some books and lately it has been happening a lot more than I would like for it to as I find myself wondering how some people were able to rate this 4 and 5 stars and with so much praise. I found that this was slow paced and in some sections, the pace was ideal as it lent itself to the imagery that the author was going for but in other moments, the pacing was dreadful. I can only assume that the author was trying to build some sort of suspen Sometimes I find myself disagreeing with the hype about some books and lately it has been happening a lot more than I would like for it to as I find myself wondering how some people were able to rate this 4 and 5 stars and with so much praise. I found that this was slow paced and in some sections, the pace was ideal as it lent itself to the imagery that the author was going for but in other moments, the pacing was dreadful. I can only assume that the author was trying to build some sort of suspension within the reader, to build a sense of urgency to flip the pages and keep going but it didn't work for me. I appreciated the narrative within the first half as the bulk of the first half is written about Charles Boatman, just one of the two main characters as we follow him returning back to Vietnam and finding it to be unrecognizable from the war-riddled version he remembers. Bergen wrote a great flawed character in Charles as he searches for what he has lost or his idea of what he may have lost; what he was hoping to find, love or forgiveness, he's not sure but something drove him back to Vietnam and there he truly lost himself in a downward spiral led by his PTSD, sense of loss, despair or a combination of any of them. This was a harrowing end to a tragic man and one that I know will stay with me for a good while; it was a very realistic portrait of what a lot of young men have stated before in other media channels that I knew that he was beautifully flawed and realistic. I found that in reading the second half, that the flow of narration and imagery fell flat in regards to Charles' children Ada and Jon, whom I didn't care for in the first half and found less interesting as the story went on. Jon who came to Vietnam with Ada in her search of their father, and I do say her search because Ada is the one actively wondering about him and needing to know what happened, is absent and selfish. Ada could have been interesting but she came across as a naive girl pushing love unto people in hopes of a response to her own emptiness. Another entry on my reading list for March, The Time In Between won the 2005 Scotiabank Giller Prize, which recognizes "excellence in Canadian fiction." If you're interested, you can read about it here. And imho, this book definitely deserved a prize of some sort. On the back cover of my copy of The Time in Between there is a blurb from the San Francisco Chronicle saying "A sparse and moving meditation on the burden of war across generations." I couldn't have described it better. As the book beg Another entry on my reading list for March, The Time In Between won the 2005 Scotiabank Giller Prize, which recognizes "excellence in Canadian fiction." If you're interested, you can read about it here. And imho, this book definitely deserved a prize of some sort. On the back cover of my copy of The Time in Between there is a blurb from the San Francisco Chronicle saying "A sparse and moving meditation on the burden of war across generations." I couldn't have described it better. As the book begins, Ada Boatman and her brother Jon are in Vietnam to search for their father Charles. He had gone back to Vietnam some thirty years after he was a soldier there to try and deal with his feelings about a certain painful experience while in the army, a part of his personal story his family doesn't know about. He revisited his time in Vietnam in his head after reading a book given to him by a friend and felt compelled to go back. But after some time, his family stopped hearing from him; Charles has seemingly just disappeared. The story has two narratives that ultimately weave together - the story of Charles and his need to return to Vietnam and what he finds there, and then Ada's story, and what she finds when she goes in search of her father. SIGH. It took me awhile to finish this book. While I liked the way the author writes, I wasn't crazy about the story he was telling. It was very sad (which obviously seems to be a theme with me right now) and I didn't understand why the main character did some of the things she did. AND, I hated the ending. It was abrupt. I hate that. I feel you are left hanging, in a way. I may read another one of his books, only because I really liked his style of writing. It just may have been the story itsel SIGH. It took me awhile to finish this book. While I liked the way the author writes, I wasn't crazy about the story he was telling. It was very sad (which obviously seems to be a theme with me right now) and I didn't understand why the main character did some of the things she did. AND, I hated the ending. It was abrupt. I hate that. I feel you are left hanging, in a way. I may read another one of his books, only because I really liked his style of writing. It just may have been the story itself that I had a hard time with. I don't know. And I think its one of those that everyone who reads it will have a different opinion about it. ***I gave this three stars only because they don't have a category for how I felt about this book. And because I think everyone would have varying opinions about it, I don't want people to shy away from it. Like so many other vets, Charles Boatman never recovered from his tour of duty in Vietnam. His squad was ordered to clear a village and while doing so, he shot a boy. He never talked about and he never forgave himself. He returned to his young wife and daughter Ada but life was difficult - the recurring dream haunts him. His wife had twins (girl Del and boy Jon). He discovered his wife had a lover and leaves, moving to a refurbished caboose in British Columbia. He's taking a correspondence cours Like so many other vets, Charles Boatman never recovered from his tour of duty in Vietnam. His squad was ordered to clear a village and while doing so, he shot a boy. He never talked about and he never forgave himself. He returned to his young wife and daughter Ada but life was difficult - the recurring dream haunts him. His wife had twins (girl Del and boy Jon). He discovered his wife had a lover and leaves, moving to a refurbished caboose in British Columbia. He's taking a correspondence course to be an accountant. Then his ex-wife dies and his kids arrive. Suddenly the kids are all grown up. Del's living with an older man; Jon's gay; and Ada, well she's still searching. Charles gets a call from a former war buddy who tells Charles he is sending him a book about the war that he must read. The book was written by a deserter from the North Vietnamese army. When Charles finally starts the book, he cannot put it down. When he finishes, he starts over. So Charles goes to Vietnam. He doesn't tell his kids but calls his son a month or so after he gets there. Then he goes missing. Ada and Jon go to Vietnam to look for him. This is a sad story but it is not depressing. It seems that the Vietnamese vets handled their war experience differently from the American vets. They do not understand the Vietnamese author of the book Charles read and they do not understand Charles. Ada tries to find out what her father was looking for. She learns more about herself than about her father. I enjoyed the book -- it made me think. I liked the character development and the interplay among the characters and what it revealed. I will have to read more of David Bergen's novels. This is one of those books that I have been wanting to read ever since it came out. The writing is beautiful in sparse explicitness. The first 2/3rds of the book were riveting, but I didn't get the point of the last third. I felt the main story lines were told and wrapped up, but Ada is still lost and carries on so the writer keeps on telling her story, even though she doesn't really have one. This one’s a bit slow without a lot of exciting action, but the story is beautiful and captivating. I liked the characters, and the descriptions of Danang were great. I really enjoyed this book because it is so beautifully written. The pace is slow, as befits the novel, and though the plot is not incredibly dramatic, the characters, especially Ada, feel real and very much 'in transit' and 'in between' - lost as children who 'lose' a parent feel. Also, I have travelled twice to Danang and Hanoi in Vietnam, so I was totally enamoured by that aspect of setting. - Ah, to look forward to a book, only to be disappointed again! Yet another war-themed book that didn't really have anything original to say. War is sad. We get it! War leaves casualties; sometimes not always physical. War isn't fair, etc, etc...But what else??? What else can you teach a younger generation who have not lived through the agony of war how to be more empathic and connected to those who have sacrificed so much for us? - I've had this book on my shelf for awhile...Many years ago I sta - Ah, to look forward to a book, only to be disappointed again! Yet another war-themed book that didn't really have anything original to say. War is sad. We get it! War leaves casualties; sometimes not always physical. War isn't fair, etc, etc...But what else??? What else can you teach a younger generation who have not lived through the agony of war how to be more empathic and connected to those who have sacrificed so much for us? - I've had this book on my shelf for awhile...Many years ago I started it, but never finished - with the intent of one day getting back to it. Once I did, I realized why I abandoned it in the first place. - Bergen's prose is good. It's so-called "sparse", but it works and I didn't mind it. - What I didn't like, however, was the lack of overall story/plot and/or character development. I never really felt like I knew anything about Charles or Eva Boatman (the 2 main characters who drive the story). There were just overall generic and bland. Charles is sad, carries ghosts from his past...Ada is the responsible, eldest child who is closest to her father...blah blah blah...Other than that, not much is gleaned of their characters from the novel. - The so-called secret that Charles carries, really isn't much of a secret, and therefore anti-climactic. - Even the mysterious, evocative land of Vietnam could have had so much potential there to anchor the setting and complexities of the Vietnamese people, but it was only BLEH. I felt I learned NOTHING at all about Vietnam, its history, sad past or conflicted future. Bergen explores coping with grief in "The Time In Between"; needless to say, it was not a happy book. His prose is plain-- which is something I don't mind, but it's a little surprising that the book won the Giller. Yet, the plain prose makes it easier to read through the characters' introspection and detailed sequences of mundane actions. I'm only rating this as "ok" because the story wasn't very remarkable, but it was readable. You can read my review with either one of the links below, however if you have read this book yourself, please stop by my blog and vote on your rating of it. I love the first part of this book and the story could have ended with the first section. Up until I started part two, I would have given this at least four stars. For me the second part of this book ruined the story, I felt it dragged it out unnecessarily. I listened to this as a book on CD - the readers were excellent and I wish I could say I was engrossed by the story, however, I found the father to be an unappealing character with no thought except for his own self gratification and his self involvement. Not a book I would recommend. This was very boring and irrelevant writing that could have been an interesting look at a former Vietnam veteran returning to an unrecognizable land thirty years later. Bergen falls short, especially in characterization, but also in connecting all of the pieces. I haven't read much about Vietnam so this gave me information about the 60's there. The author's style is short, curt sentences. I guess that I like words to flow easily and beautifully. Also it was hard to identify with these characters. If it weren't for book club I never would have finished this. I couldn't relate to anyone. I didn't find the characters believable. The main character, in my opinion, would not play Scrabble. Not recommended. I read it because it won the Giller Prize. Not what I had expected. I enjoyed the beginning more than the end. Anticipating a better ending caused me to finish the book, but it fell flat in my opinion. Maybe I just missed the point! I read it but I can't really remember it. Therefore, I consider it forgettable. Awful. I can't think of anything else to say about this book. I really enjoyed this well written novel. The author, Bergen was raised as a Mennonite in Manitoba. He says his decision to write fiction was influenced by the church to stifle questions and criticism. "Writing is a way of figuring things out, if you can't ask questions in church, maybe you can ask them in fiction." I do hope Bergen has since realized that there are Menno churches around that not only allow, but encourage the questions. In this book he writes about Charles who served in the Vietn I really enjoyed this well written novel. The author, Bergen was raised as a Mennonite in Manitoba. He says his decision to write fiction was influenced by the church to stifle questions and criticism. "Writing is a way of figuring things out, if you can't ask questions in church, maybe you can ask them in fiction." I do hope Bergen has since realized that there are Menno churches around that not only allow, but encourage the questions. In this book he writes about Charles who served in the Vietnam war and returned home a different person. 29 years later, Charles feels the need to return to Vietnam in search of something, he doesn't really know - maybe redemption, forgiveness? While in Vietnam, Charles disappears. 2 of his adult children, Ada & Jon go to Vietnam to find him. In their search, they met people that knew Charles. Ada & Jon are also drawn into the culture of this country and also fear their worst nightmare of what could have happened to their father. An interesting bringing together of all of it, and of course Yen is the ghost of the boy that her father killed in the village where she visited, where they spread his ashes, the boy he thought at first was a soldier, but turned out to be just a boy, a boy that haunted him and his children until now, or maybe forever. A wrong cannot ever really go away. "She said, 'There are many things I love here. The rooster calling in the courtyard. I love that. Or having tea with that old man today. We didn' An interesting bringing together of all of it, and of course Yen is the ghost of the boy that her father killed in the village where she visited, where they spread his ashes, the boy he thought at first was a soldier, but turned out to be just a boy, a boy that haunted him and his children until now, or maybe forever. A wrong cannot ever really go away. "She said, 'There are many things I love here. The rooster calling in the courtyard. I love that. Or having tea with that old man today. We didn't say a word, just sat there.' Then she told Vu that she and Jon had let their father's ashes go off My Khee two days before. She said that when she had been out in the boat with Jon, and she had looked back at My Khee she had realized she didn't really know this country. 'But,' she said, 'I have met people here who I will remember for a long time.'" I know that as I get close to the end, even in a book that does not sing to me, that sometimes there is more than I realized, and I'm proven wrong by my lack of interest, as though I have betrayed the author, as though I am being proved that I was wrong in my denial of the greatness of a work, or maybe I am just succumbing to pressure. Anyway, here is something worth remembering. "It was only the next day, while she was sitting alone on the rooftop of the hotel, that Ada cried. The evening before, she had said goodbye to Jon, and the finality of everything now came to her as a vast emptiness. She was alone, with her face raised to the sun, and at some point she became aware that only several weeks earlier she had been sitting in this same spot and she had not known, at that time, that her father was dead. Now, she knew. And she wept. She wept for her father and for his sadness that she once thought she had understood but could not now, nor ever, comprehend. And she wept for herself and her loneliness, though at this moment she would not have wished to rid herself of that loneliness, because it came with a certain startling beauty." In searching for something, anything to find worthwhile: Visual artistic vision. This interests me, although I don't meet people in real life. I meet them between the pages of a book, or on the screen mostly. "Charles...complicated Vu on his English. Vu dismissed this. 'As I said, I have foreign friends, and with these friends I must speak English. How many people from Uruguay know Vietnamese? You see.' He drank and then leaned foward, elbows on his knees, and said that it was to his benefit to meet people who came from another place, because that could only add to his artistic vision. 'Imagine sitting in a room by yourself with nothing to look at, no one to talk to. I need other people. I need images. I need the solid world. I am asked somethings why I don't move to another country where there is more freedom, and my answer is that I cannot be an artists elsewhere. How would I remain faithful? From which place would I tell my story? Finally, of course, the artist is alone, like Dang Tho, the writer we talked of the other day. I feel great envy and pity for him. He has succeeded in angering the authorities, but he is also separate. This is what happens, isn't it? A man has a vision which is not political, but others make it so, and so the vision is made smaller because some person of little consequence decides that the man with the vision is too big, too proud.'" "'That's what happens,' Charles said. 'We make certain decisions and the decision takes on a story and the story has a history of its own and the history becomes fact. Might be warped, but it's fact. Not a whole lot different than luck.'" An example of why this book does not thrill me, nor does it inspire me. Ada is in the house in Hanoi and sees bats and she is afraid they will get inside. The next day, she tells Jon that she dreamed about their mother and then woke up remembering there were bats and was afraid they would come inside. Fact, fact, incident reports, repeats. It's a style, but it does not mean anything to me. I want to get it read and out of my head, so it doesn't take me away. It is the kind of writing that is rote writing, that is uninspired, that is bad writing, but he's using it for effect. I can't buy into it. "...Unable to sleep, she sat on the balcony and waited for the sun to rise. Everything, the stars, the half-moon, the palm trees, seemed placed upon a great and implausible backdrop." Born in Port Edward, British Columbia, author David Bergen worked as a writer and high school English teacher in Winnipeg, Manitoba, before gaining a great deal of recognition in Canada when his novel The Time In Between won the 2005 Scotiabank Giller Prize, one of Canada's most prestigious literary awards. The novel also received a starred review in Kirkus Reviews and was longlisted for the 2007 Born in Port Edward, British Columbia, author David Bergen worked as a writer and high school English teacher in Winnipeg, Manitoba, before gaining a great deal of recognition in Canada when his novel The Time In Between won the 2005 Scotiabank Giller Prize, one of Canada's most prestigious literary awards. The novel also received a starred review in Kirkus Reviews and was longlisted for the 2007 IMPAC Award. Bergen's debut novel, A Year of Lesser, was a New York Times Notable Book, and a winner of the McNally Robinson Book of the Year award in 1997. His 2002 novel The Case of Lena S. was a finalist for the Governor General's Award for English language fiction, and won the Carol Shields Winnipeg Book Award. It was also a finalist for the McNally Robinson Book of the Year Award and the Margaret Laurence Award for Fiction. Additionally, Bergen has received the 1993 John Hirsch Award for Most Promising Manitoba Writer, and the 2000 Canadian Literary Award for Short Story. In 2008, he published his fifth novel, The Retreat, which was longlisted for the Scotiabank Giller Prize, and which won the McNally Robinson Book of the Year Award and the Margaret Laurence Award for Fiction.